I somehow ran into this innovative dresses and had to share! 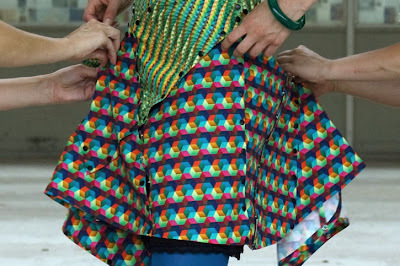 The Replacement Dress is made of three dresses each with a different multicolored pattern. The pieces are hold together with buttons and can be exchanged between themselves. So you will end up having three different 'ingredients' to style the dress the way you like it. Awesome, right? Both concepts rely very much on the patterns. They are the work of graphic designer Michiel Schuurman. The idea is that because they are self-designed, the person will care much more about them and therefore, clothing last longer. Clever, right? Well, I'm not sure whether I wouldn't be a bit worried about not messing up the beautiful black&white pattern in the first place, but well. I suppose I should have my eye out not to 'colour outside the lines', haha. Rapidly changing fashion? Here we come! Wow, that is amazing! I especially love the first idea. The last one seems a little bit hard to change with all of those buttons. But the idea of versatile clothing is always very appealing. "Tailor, there's a lady in my suit!"